All wrapped up for Christmas! Finally now Christmas Eve is here, it seems I've eventually got everything all wrapped up! Everything is all done and dusted in the studio, paperwork is organised, emails answered, schedules in place and for next years art adventures which are arranged for you all to share. It's been a busy ol' year and I have now decided to hang up my boots and brushes for a bit, chill out, rest, refresh and...pour my self a good hefty Jura 'Superstition'! I've had some frenetic last min. 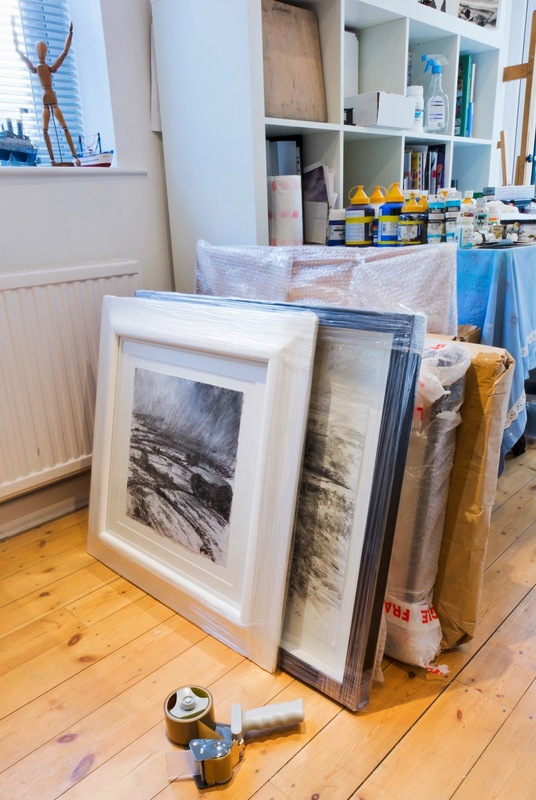 packing and wrapping for galleries, clients and an all important batch for a very prestigious gallery in London! If I get through the 'second gate' I'll be shouting for joy...just like my manikin in the studio on the window ledge is doing right now as he sees all the work is done and he can have the place to himself for a bit! To conclude, I would just like to say thank you all for reading my posts and for the business connections and creative contacts made with me by one and all throughout 2014. I'm delighted and very grateful. I look forward to working with you all again and teaching you all on many new exciting art courses, workshops, demonstrations, art events, publications and residential art holidays throughout the coming year (not forgetting the fun in the sun 'Dalvaro Art' holiday in June '15 in Spain!). Here's wishing you a very Happy Christmas and a creative and rewarding 2015. Its Winter but I'm 'springing' into action! With our major exhibition just 4 months away in April '15 it's a case of taking stock, planning, packing, labelling, listing, organising, sorting, framing...and so much more. The first fab four months of 2015 are going to be very exciting indeed and yet daunting at the same time too. I am though, as always, up for a challenge! Many of the paintings for the exhibition have already been done. They need to be! With over 30 paintings needed per artist to fill the big, bright and beautiful exhibition space at 'Inspired By...Gallery' within the prestigious North York Moors Visitors Centre at Danby, North Yorkshire, it would be a daunting task indeed to get them all done with all my other important art commitments to teaching and so on if I'd not been setting some aside already! Rest assured, the show will be complete and a fabulous one as well. 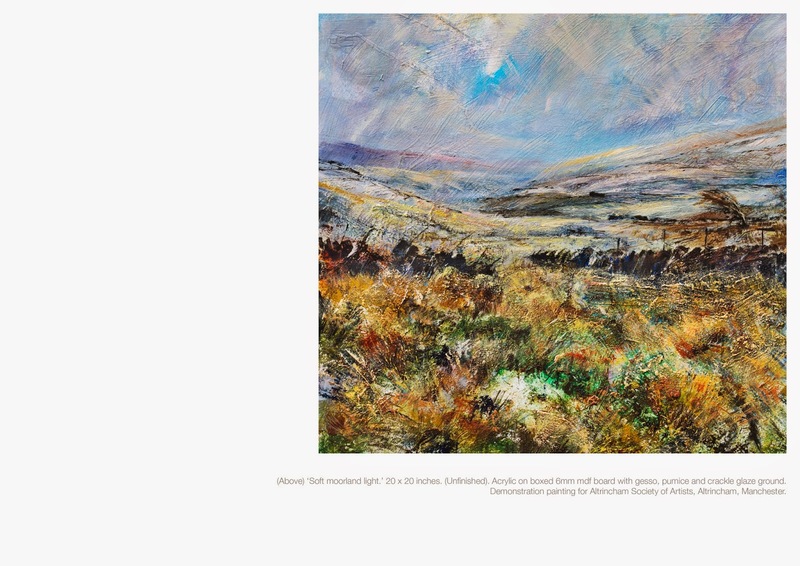 Illustrated is one of the expressive mixed media moorland paintings I'll be exhibiting created within the north York moors. Such a beautiful and dramatic location one cannot help be inspired! The great magazine from the SAA (Society of All Artists) called 'Paint' is full of creative news and useful hints and tips you just cannot ignore. The editors and team who put the magazine together really have their finger on the pulse with what is happening in todays ever changing art world which is issued to all its members throughout the year. Another great reason to join the SAA! 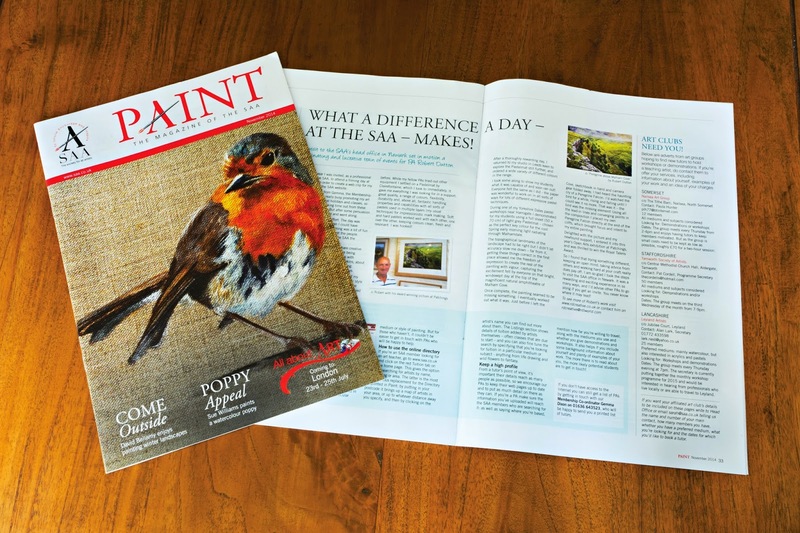 as a professional member it was great to have a feature in the July issue of paint soon after winning the 'Royal Talens Award' in an open competition at 'Patchings art Festival', Calverton, near Nottingham in June 2015 focusing on my visit earlier in the year to SAA 'HQ' at Newark - a really rewarding day which helped me win my award. The SAA team at Newark introduced me to some really interesting and exciting new art papers and supports which I was kindly given to take home and try. 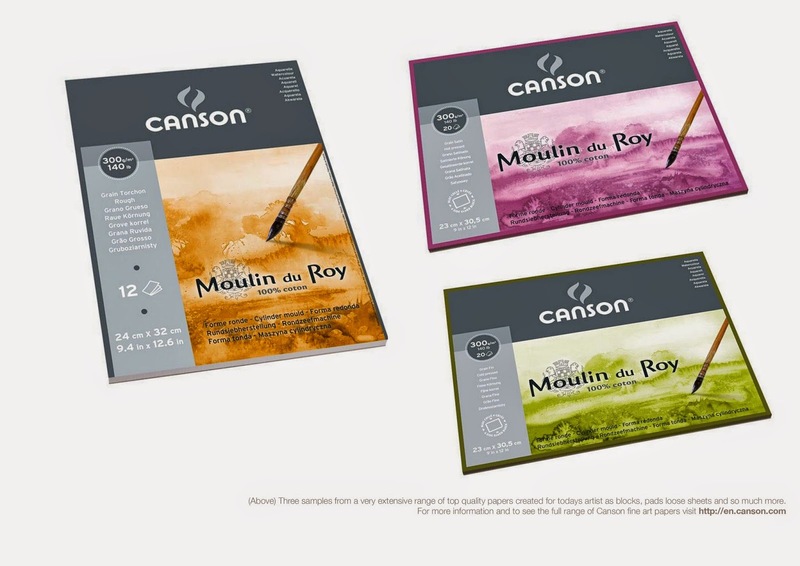 One particular paper I was really taken with was Canson Mi-Teintes 'Touch' paper - a really responsive pastel support available in 14 very useful colour shades created by Canson. I liked the paper so much I was able to create some outstanding work on it one of which gained me the open competition award. 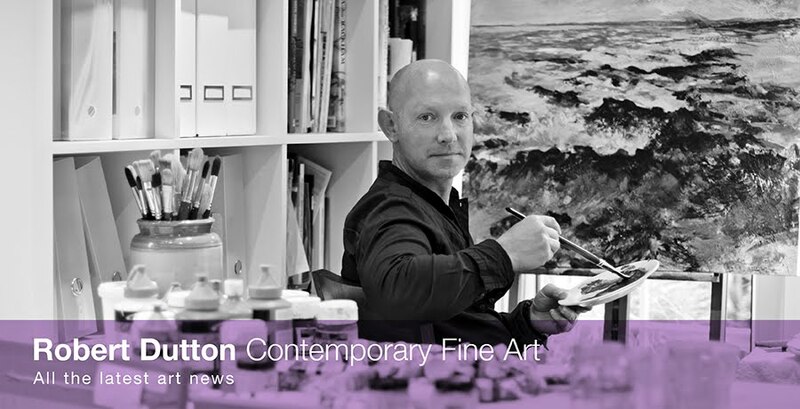 Things have gone from strength to strength with the pastel paintings I create on Canson Mi-Teintes 'Touch' paper so much so that Canson have now invited me to become an Ambassador for their papers. If I had been 'to busy' or had given the invite to visit SAA HQ in Newark a miss I'm sure that none of this would have ever happened. Thanks again SAA! With a promising NewYear ahead working with Canson again at another prestigious art event - this time at 'Patchings art festival' in June '15 to include demonstrating for them I'll paint the town red this Christmas! A great spread on the table this Christmas! The gift to us all from Canson, whatever time of the year, is their superb papers created for the pastelist with 'Mi-Teintes Touch', the strong easy to handle, responsive 350gsm paper (available in 14 didfferent carefully created colour variations), for water colourists the superb and forgiving, easily adjustable with lots of reworking possibilities, sheets, pads and blocks of 'Moulin du Roy' and 'Vidalon' another beautiful watercolour paper from Canson. Not forgetting either Canson's responsive 'Mixed Media XL' papers, there are lots of opportunities for you to really get 'stuck in' this Christmas! Have a great creative Canson Christmas....I know I shall be! 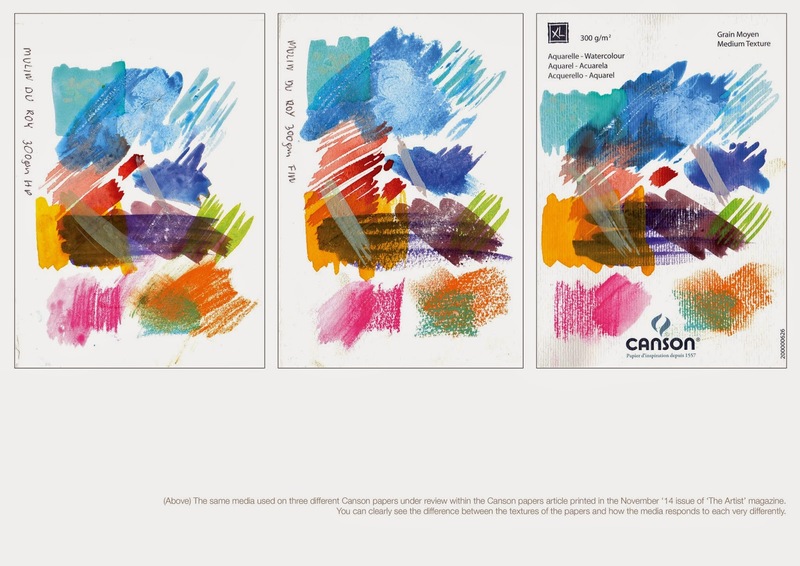 Canson papers are available at all leading art suppliers. The Artist' magazine is available from all leading newsagents. Stripping off completely for the sake of my art! Yes, I thought that would get you interested! Well, although now in the raw...what is going to to shown on this stripped down canvas will be a well hung presentation I can promise you! 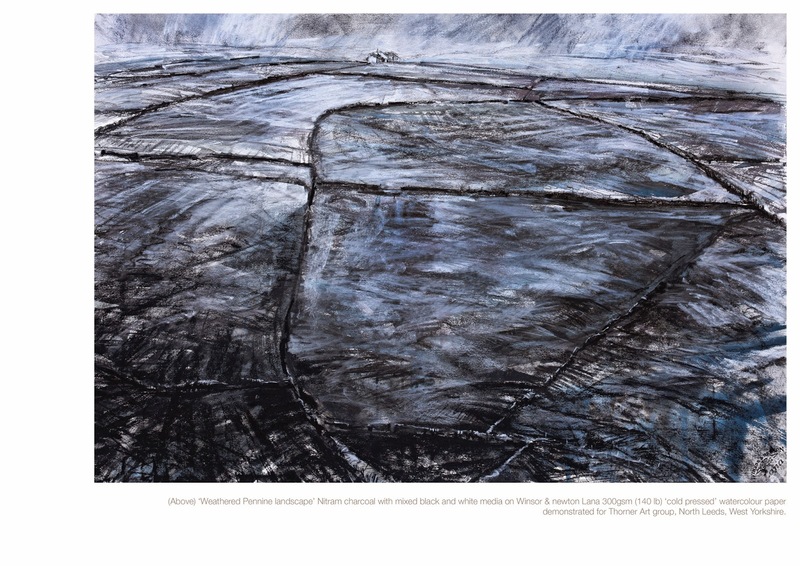 The painting will join several others I'm now putting to one side for a really great joint exhibition "All Creations Great and Small' I'm having in April 2015 with 3 other great Yorkshire artists, Jo Garlick, Helen Patterson and wildlife sculptor Stef Ottevanger on show at 'The Inspired by' Gallery at The North York Moors visitors Centre at Danby, North Yorkshire from 16 April - 4 May 2015. Several paintings have already been put to one side for the exhibition which has been over a year in planning. Things are hotting up now with a true count down after Christmas on the cards with April 16 (preview evening) only a stones throw away really on the artistic calendar! With the North York Moors forming the total inspiration and influence for all four artists taking part there is plenty of my outdoor sketches on the moors to convert into a major mixed media expressive painting on this 30 x 30 inch bespoke Amsterdam linen canvas! Watch this space...something good (I hope) will emerge painted on it for you the other side of Christmas for you too see as a seek preview for the exhibition! The Lake District is really special and means so much to so many. Personally I find great solace and creative inspiration in every corner of Cumbria especially in the Western Fells and non more so than along the shores of Bassenthwaite Lake. 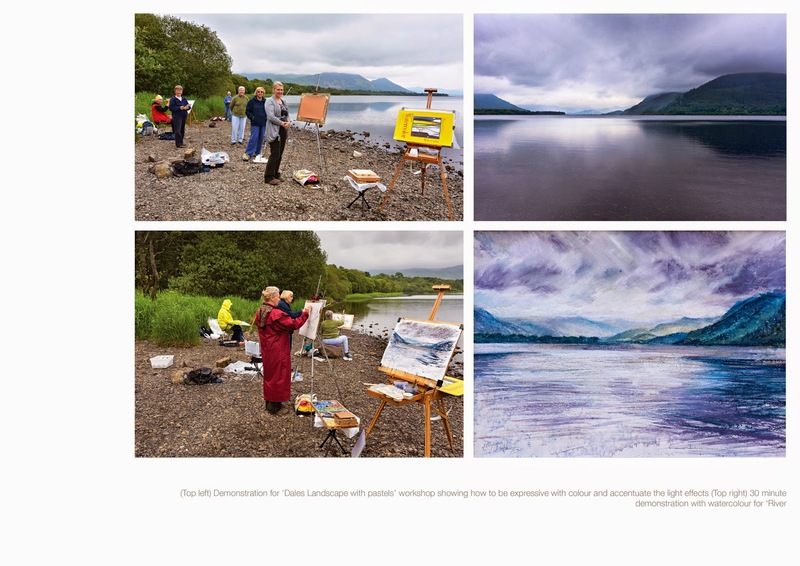 My joy for this special corner of Cumbria was shared in the summer of ‘14 with enthusiastic art students having a creative residential art break with me at Higham Hall in the Western Fells with Bassenthwaite Lake forming much of the inspiration for our outdoor painting during this superb art holiday. 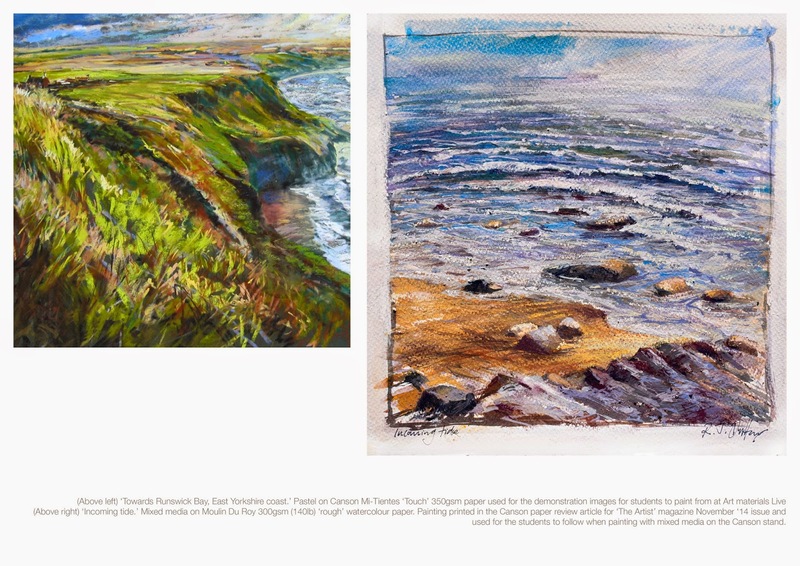 Strathmore papers were used time and time again to create really expressive paintings with all sorts of different media on Series 300, 400 and 500 papers for both outdoor and studio paintings with exceptional results created by all throughout our creative painting week. Of particular merit was Strathmores 300. The surface of the paper reminds me of a very fine canvas which I really liked and lots of wet in wet techniques and reworking are easy to achieve on this paper. I used Strathmore 300 Series warercolour paper on location one June morrning when painting along Bassenthwaite Lake in notorious changable Lakeland weather. The fluctuating light was pretty tricky for everyone to handle but by using Strathmore Series 300 Series the subtle changes in the weather were easily to handle and for all to paint with confidence since the strength of this heavy weight paper allowed a great deal of reworking to create paintings with a really expressive approach. 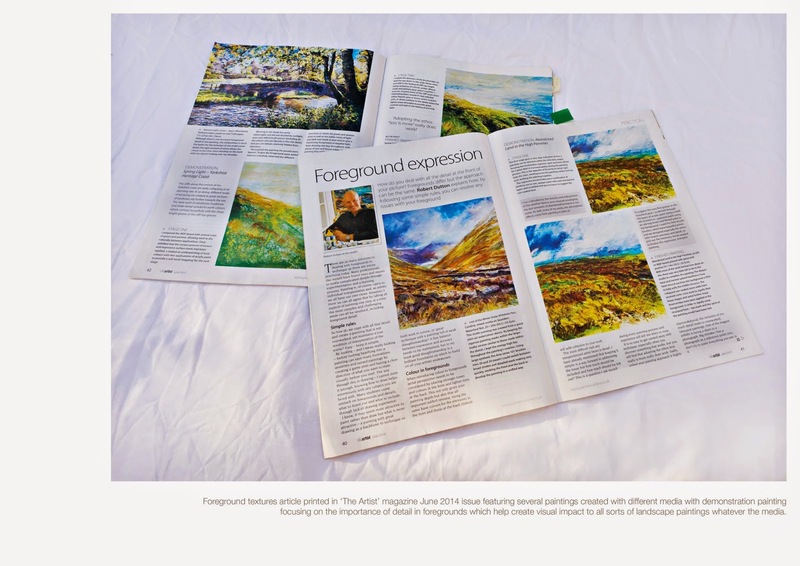 The painting I demonstrated was later finished in my studio in Leeds and formed part of a visual reference for a full review of Strathmore Series 300, 400 and 500 papers (amongst others) as commissioned by ‘The Artist’ magazine, which has just been published (January ‘15 issue) which is featured below. 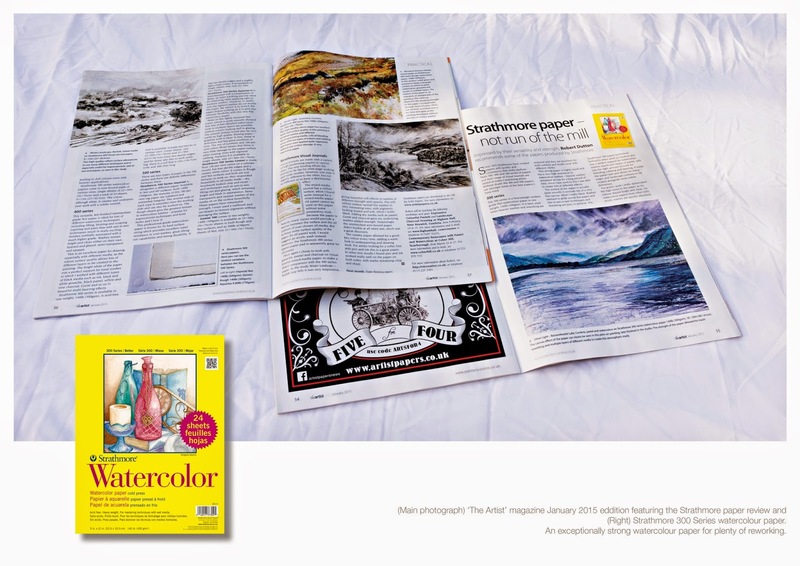 Sharing the merits of these professionally produced American made papers, Strathmore can now be shared with a much wider audience thanks to ‘The Artist’ magazine and the Strathmore paper review. For me there is an extra special bonus - my painting of Bassenthwaite Lake on Strathmore 300 Series created along the shores of Bassenthwaite Lake, feature in ‘The Artist’ magazine, now hangs, pride of place, in Higham Hall for all visitors to Higham Hall to enjoy! ‘The Artist’ magazine printed by The Artists’ Publishing Company Ltd. There is a lovely rhythm and flow that runs right through Pickering and its not created by Pickering Beck but more by the warm and friendly Vale of Pickering Art Club. 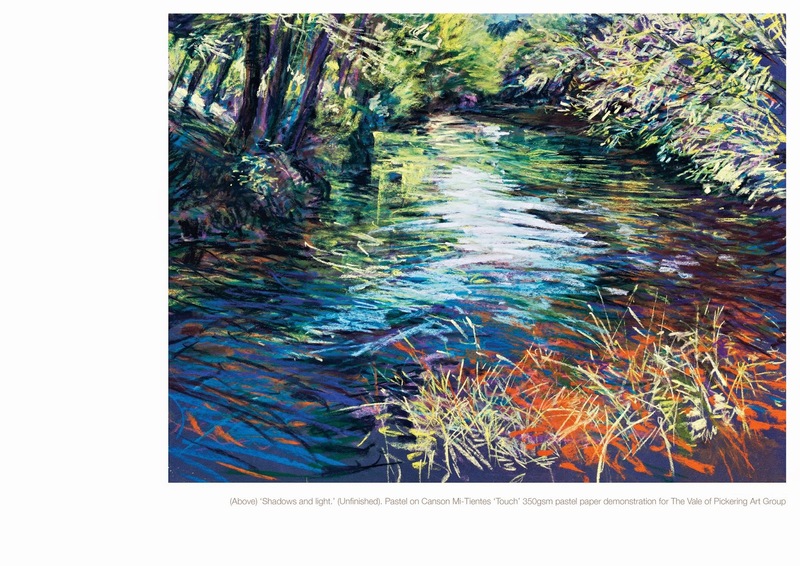 All members certainly made me feel very welcome when I travelled from Leeds in November '15 to give a pastel demonstration called ‘Shadows and light’ – a delightful river scene. I know the area well in the painting. In Nidderdale between Glasshouses and Pateley Bridge the Summer trees hang over the water perfectly and at every turn there is a delightful composition to be painted. this is one of them! 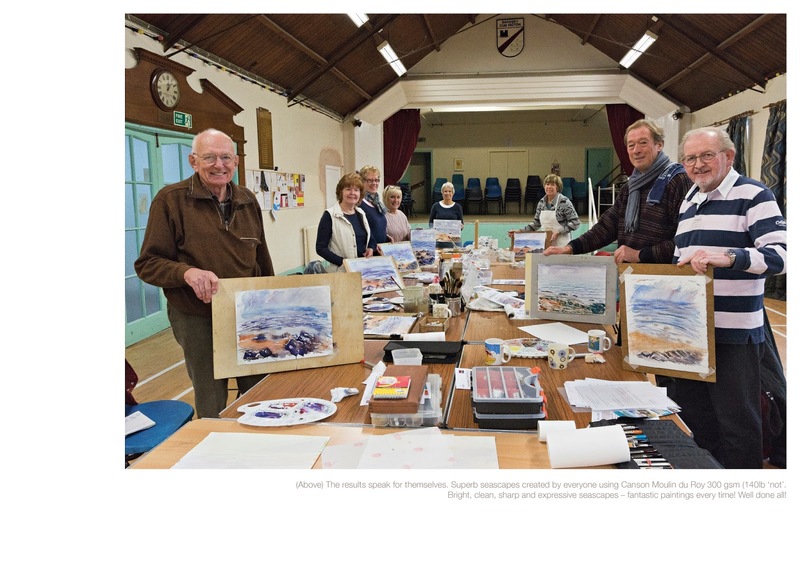 The Vale of Pickering Art Club members watched with delight as the painting was created for them. I described every step of the way colour choices, pastel applications, techniques, hints and tips, use of fixative to deliberately darken areas...and so much more! Choosing Canson Mi-Teintes ‘Touch’ paper in a dark blue tone I began by blocking in the major shapes with green shades colours and tones alternating between different brands of hard and soft pastels building the layers as I went until I arrived at the above stage now ready for the finishing touches back in my studio in Leeds. A big thank you to everyone for their enthusiastic appreciation right at the end, questions and interest during the interval between proceedings and a very special thanks indeed to Lesley Price who was very kind to invite me along, make contact and organise everything for such a successful night. I’m looking forward to meeting you all again for our workshop on 9 May 2015 this time switching to acrylics mixed media for a dramatic seascape. There’s plenty of opportunities and time I’m sure for everyone coming to the workshop to grab some seascape reference along the East coast which isn't to far away. I may bump into you there at some point. It’s highly likely as I’m always there painting and drawing so if you see me, do say hello! I get a real thrill when demonstrating with black and white media since tonal drawing and painting at the same time with charcoal, ink, black pastel, Conte is really exciting. Mixing drawing and painting media together is what I do in the studio in preparation for my 'big' paintings so it was great to start one for Thorner Art Group in North Leeds close to where I live. At first I begin by creating the design and tonal arrangements with loose Nitam charcoal before switching to black ink washes and then back again to Nitram charcoal and pastels in combination. Working vertically I allow loose washes with big brush strokes to run down the sheet which is very liberating and exciting to do. These drips and long streaky staining marks always become an integral part of the finished painting. It's very thrilling for audiences to watch this happen and see a painting or drawing unfold through ever increasing layers of paint exploring textures and marks under each to build a work of art of demonstrating great textures, energy and expression. Choosing Winsor & Newton 'Lana' 300gsm (140lb) 'mat' watercolour paper to work on, the smooth surface allowed the Nitram charcoal to glide across the surface. Nitram charcoal is a great choice due to the high quality of the charcoal and comes in different sizes and 'hard' and 'soft' grades H, HB and B as well as Bâtons Moyens* Académie Fusains** and because I was able to vary the textures of the very unique charcoal on this lovely watercolour paper, the texture and finish I was able to create was really great. I often select Winsor & Newton 'Lana' cold pressed watercolour paper to draw upon in sheet form due to the quality of the surface texture and the embossed branding logos in the paper shown in the bottom right hand corner on this paper. These branded marks in my papers are very important to me as they display a selection of quality by me, the artist. I often 'float' my drawings in the frame) showing all the deckled edges and every bit of the paper which offers something different but celebrates every inch of the paper, especially when working full sheet. No need to do anything else to this drawing. I’m delighted to say...it’s finished so thank you Thorner Art Group! It was a real pleasure demonstrating for you and I hope to be back again ASAP! The advantage of Nitram charcoal is its ability to not crumble or skip when used expressively when drawing. Again they are colour coded for ease of working and for a cleaner approach to charcoal drawing with paper wrappers around the end of each individual stick (in this case they are yellow). 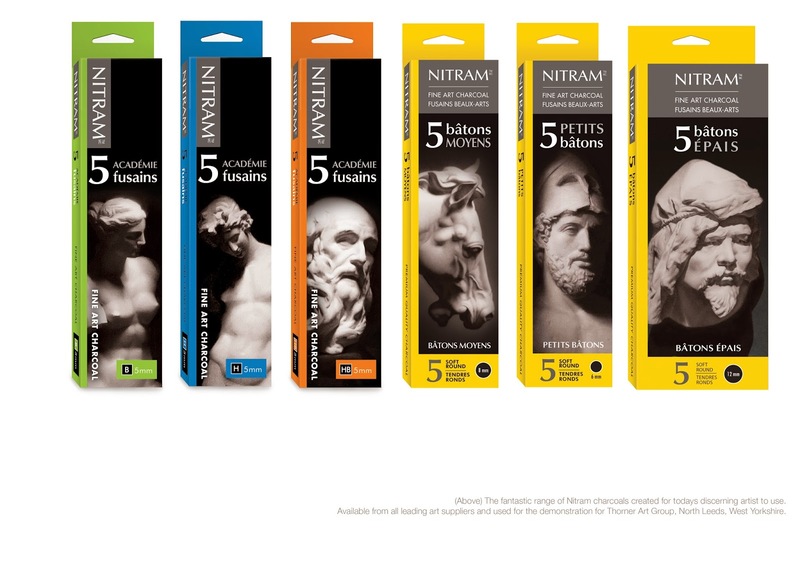 For the discerning artist that requires a rich black for drawing, then all the Nitram Académie Fusains are the answer. They are made square with easily identifiable colour codes applied to each stick as they appear in the box. The ‘B’ Nitram Académie Fusains in particular is very soft, ‘HB’ is a medium soft charcoal, holds very well to all surfaces of paper and is perfect for creating beautiful velvety tones also. 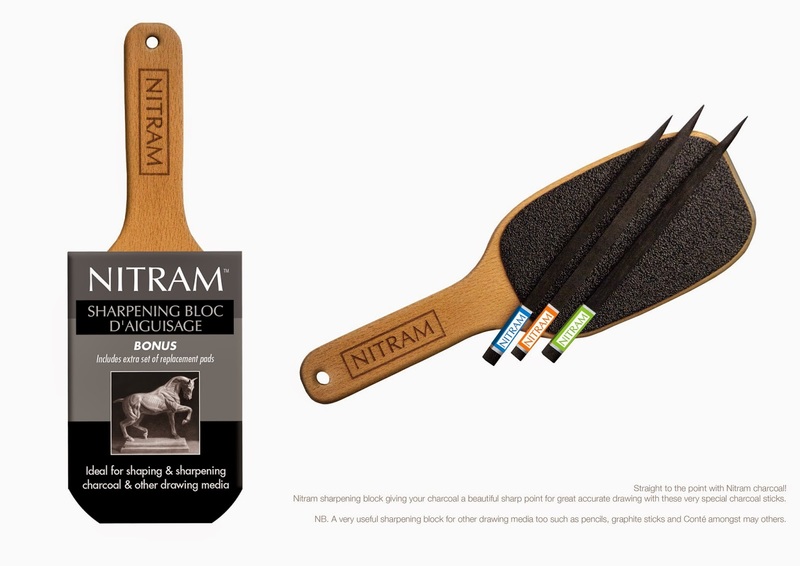 ‘H’ is the ‘hardest’ of the Nitram charcoals and this charcoal can be sharpened to an extra fine point (using the Nitram sharpening bloc to create the best effect) for creating fine detail in your drawing. Bringing the Autumn season to a close for my 10 week art course students at Bardsey, North Leeds, I organised something a little extra with the help and support of Canson for my students – a special 'Expressive Seascape' workshop to round off the course nicely. 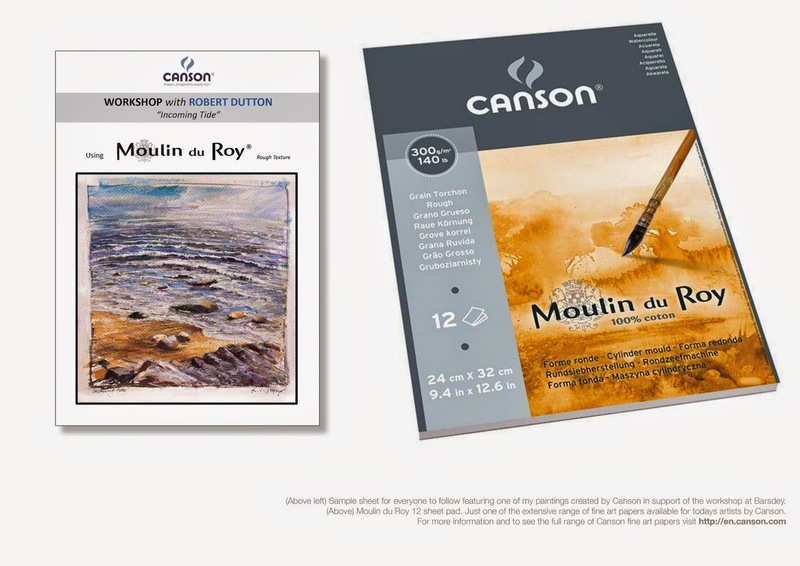 Canson kindly supplied quarter imperial Moulin Du Roy ‘rough’ 300gsm (140lb) watercolour paper for us all to use which was very generous indeed. Using printed A4 copies (one for every student) of one of my own seascape paintings used successfully in Birmingham in a similar way for students to follow when painting, everyone soon got into their stride using this beautiful and responsive Canson paper letting the paint just flow. Working side by side, step by step with my students, expressive watercolours soon began to take shape. We used lots of layering techniques with colours remaining bright , fresh and clean throughout, plenty of lift out techniques to restore the white of the paper, glazes with gouache and so much more! During the course of the workshop everyone had learned so much and most importantly, just how forgiving this 100% cellulose mould made 100% cotton watercolour paper can be. 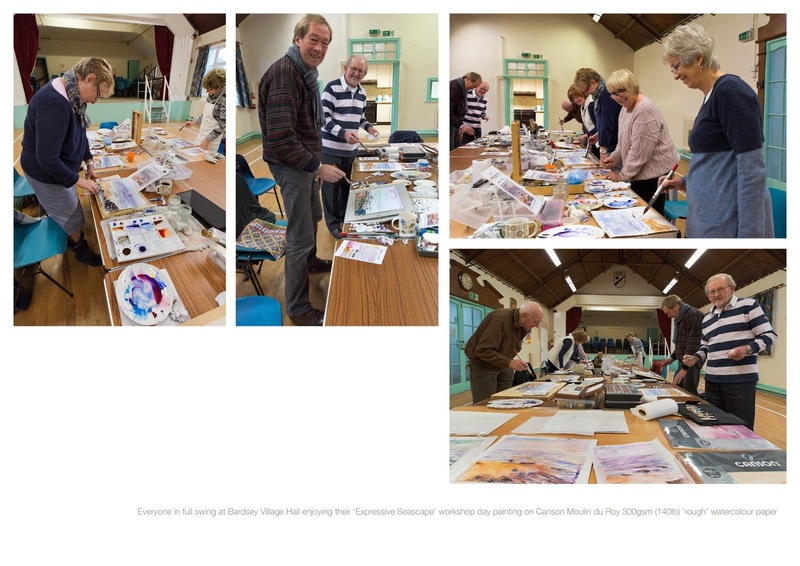 A lovely way to finish this seasons art classes from a really productive and fantastic 10 week creative art course at Bardsey Village Hall, Bardsey. For all students with different levels of creative skills, discovering new and exciting ways of painting, improving, producing great work each time and most importantly, having fun at the same time the creative buzz at Bardsey was very special indeed! 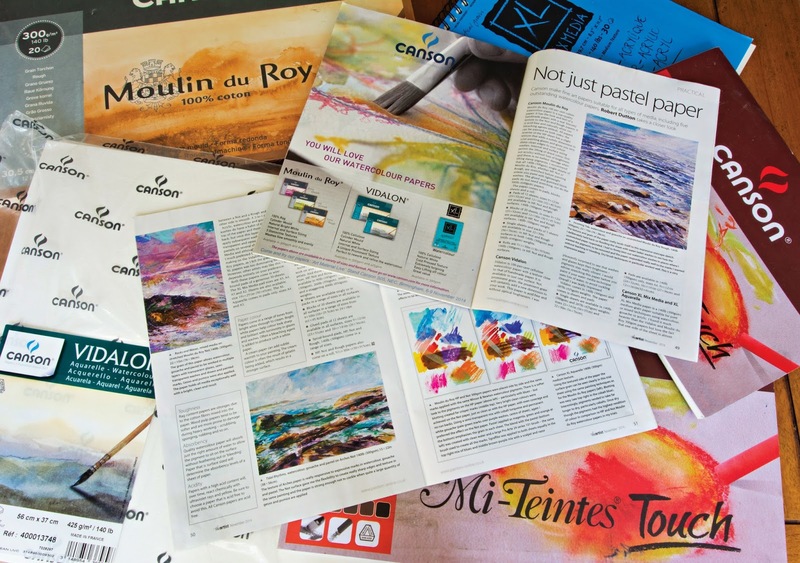 There’s a new 10 week Bardsey art course starting 13 January 2015 covering lots of new and exciting subjects with watercolour and yes, we will be using Canson papers again for sure! Bookings are now being taken and with limited places remaining for this new season course starting very soon, best to get your skates on to secure your place! A big mention and extra thanks for the success for my workshops with Canson at 'Art materials Live 2014' at Birmingham NEC goes to Pro Arte for their donation of their beautiful ‘Polar’ Series brushes – a really responsive painting brush, exceptionally well made with a very distinctive and classy white handle made in lots of different and useful sizes. Not only are these brushes useful for watercolour but also acrylics as well. I use Pro Arte brushes a lot and I brought along some of my pro Arte 'Connoisseur' brushes too which are a clever blend of sable hair and synthetic Prolene which makes a wonderful watercolour brush (whilst keeping the cost down). The SAA (Society of All artists) were very generous indeed to donate lots of their useful colourful pastels for the Canson stand and 'drop in' students to use for the Mi-Tientes 'Touch' paper trials. The SAA also were very kind to donate their wonderful high pigment content gouache and watercolour tube paints which just flow across the surface. Really professional paints which I use regularly myself and customers on the Canson stand found really great to use as well. 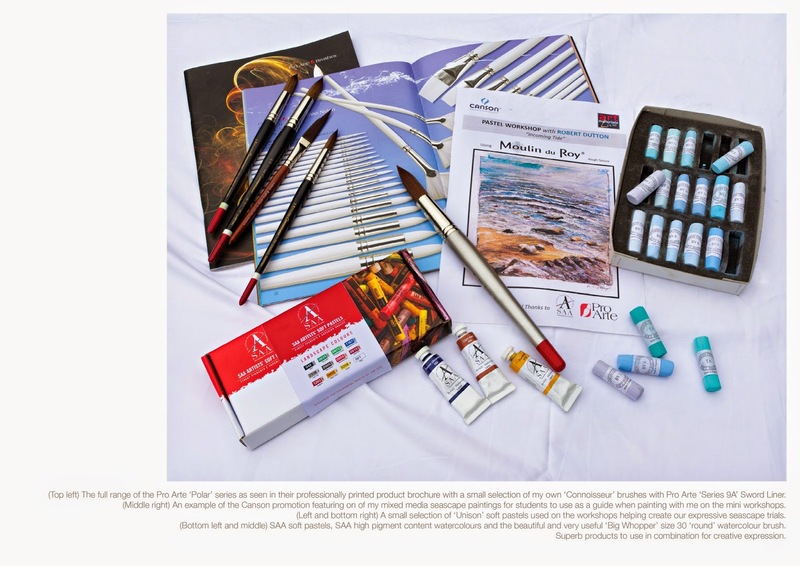 The SAA also kindly donated several of their wonderful ‘Big Whopper’ brushes (size 30) for students trialling the different Canson watercolour papers to use. The big Whopper is a big round brush which holds masses of water and pigment together and has a great balance when painting watercolour washes with it. 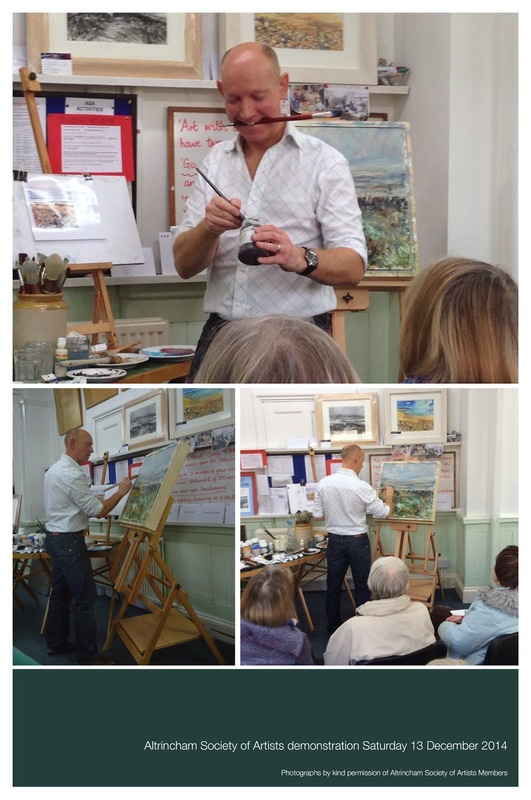 With a great tip for detail and a great size to assist big mark making and expressive work the brush was just perfect for these techniques I was teaching. A big thank you is also given to ‘Unison’ pastels who kindly donated several of their exceptional pastels to Canson for use in the mixed media workshops. Students in the mini workshops created some really great pastel paintings in a really short period of time using Unison and SAA pastels in combination. There was a real creative buzz on the Canson stand using all these superb products on the exceptional Canson papers in all our mini workshops. 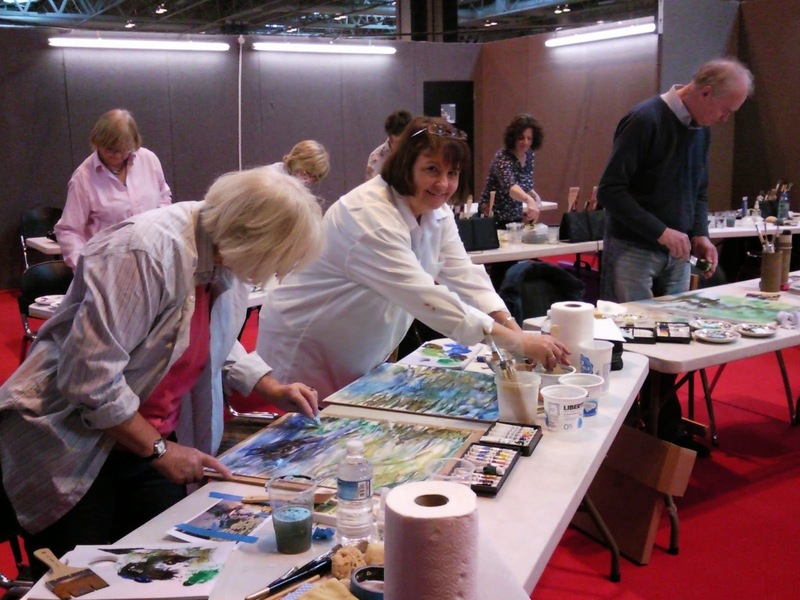 Thanks again to Pro Arte, SAA and Unison and a special thanks to all who came to the mini workshops on the Canson stand at Art Materials Live this year. It was really great to meet you, teach you some great art skills and of course share and show you just how responsive Canson papers really are using all these professional products in combination. A perfect partnership at Art Materials Live in Birmingham! 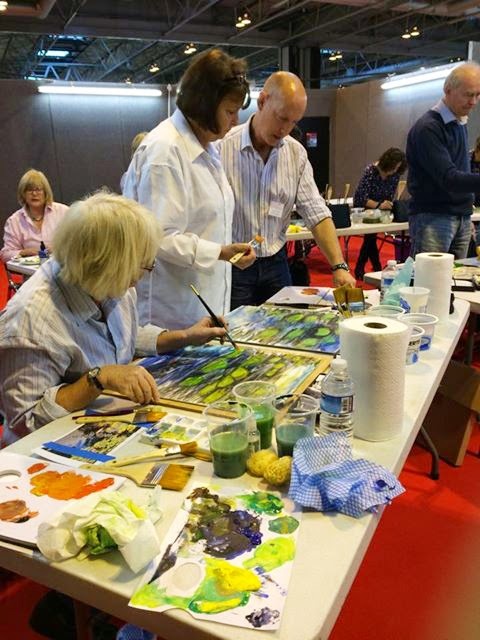 The 2014 event proved just as popular as the last except for me there was one major difference...I was working this time, first for ‘The Artist’ magazine teaching expressive painting techniques (sponsored by Daler-Rowney using ‘System 3’ and ‘Heavy Body’ acrylics) on 6 November and then, for the rest of the event until 9 November I was also delighted to be working with the French team representing Canson on their stand. With students of mixed levels of ability creating such great results every time there was a real buzz in each workshop. Behind the scenes Caroline Griffiths (events coordinator) and Sally Bulgin (the editor of ‘The Artist’ magazine), helped support the workshops in a very big way with their superb organisational skills and help with so much more ensuring everything ran just so smoothly. A great team and I was glad to be part of it. The best thing though for me was to have inspired all the students who took part to see things a little differently, loosen up their style and for others, to shake the rust of their boxed art skills and help them become creative again! 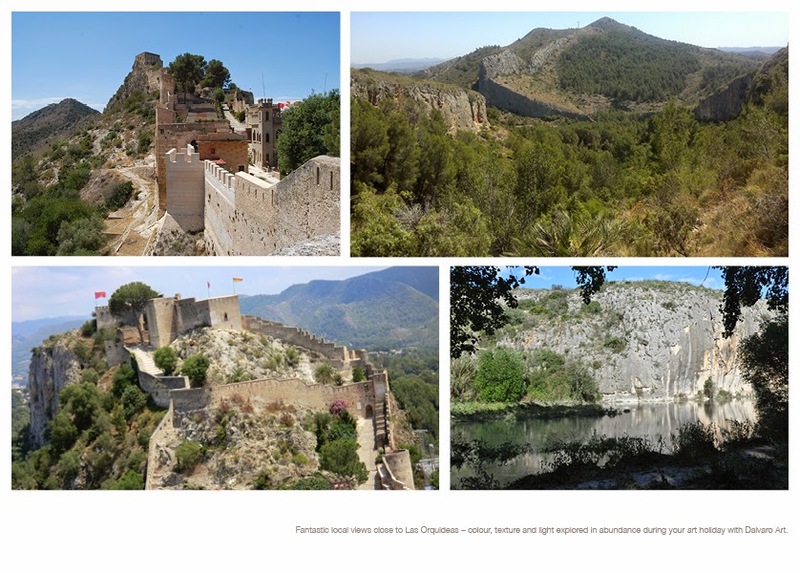 A ‘cool’ art holiday for you all in Spain! A great opportunity awaits for you to paint with me in Spain with 'Dalvaro Art' following a recent invite. 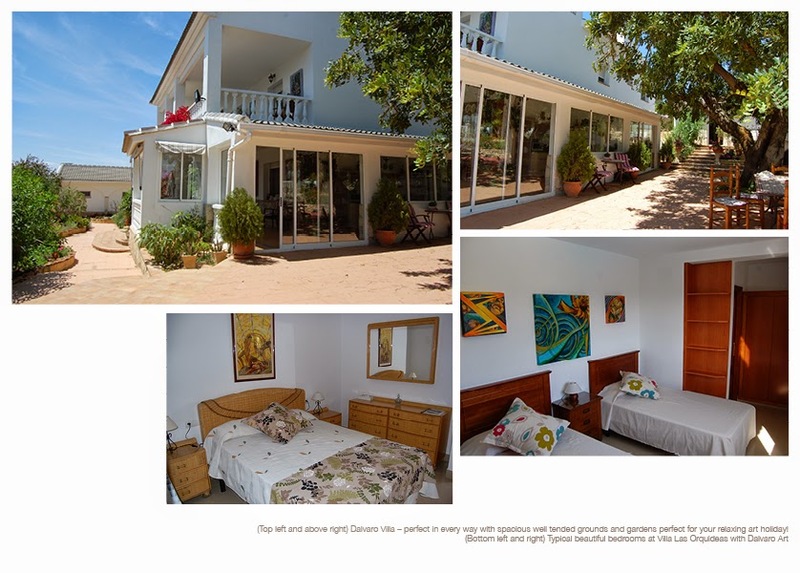 I'll be teaching mixed media art techniques from 11-18 June 2015 for this superb, well renowned art holiday right in the heart of Spain. Fantastic! 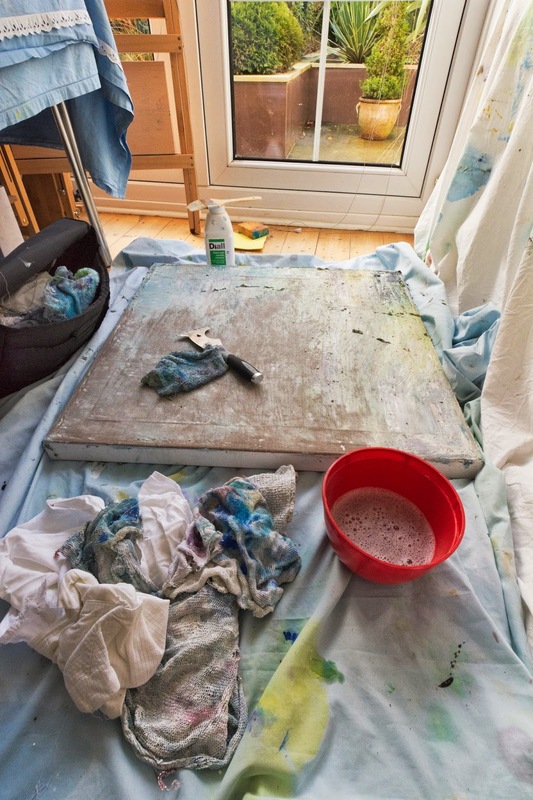 Dalvaro Art is run by Loli and Harold and they have established a superb and unique experience for all their guests to have a fully inclusive stress free, relaxing, ‘fun in the sun’ painting experience. Their beautiful home with elevated and superb views overlooks the old Moorish town of Benigánim in Valencia, Spain. Their wonderful colonial styled white villa, ‘Las Orquideas’, is just 60km from the city of Valencia, 74km from Alicante and 26km from the blue flag beaches of Gandi Across the valley is the mountain range of Benicadell, the lower plains of sierra de Marriola and several towns in the Val D’Albaida are stretched out before you. The large spacious fully equipped studio is air conditioned but with so much beautiful countryside and scenic views around us we will be venturing out of doors to explore and paint the fantastic landscape. 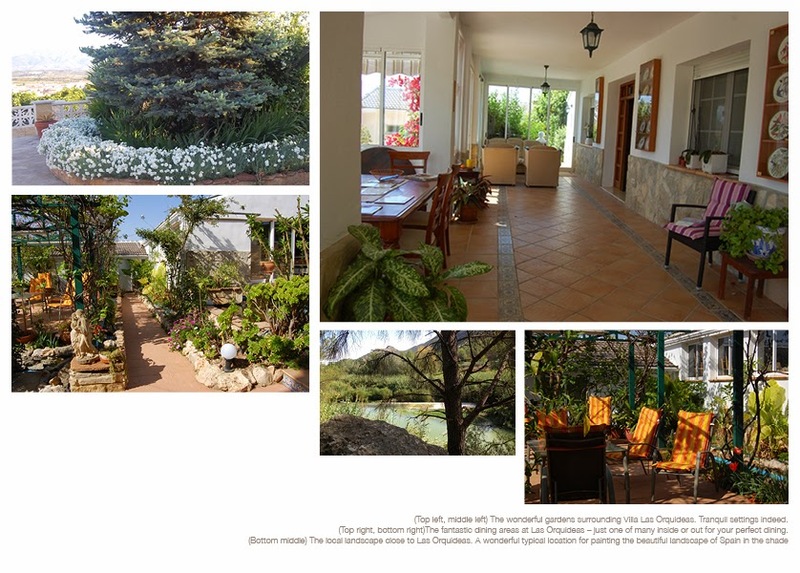 Throughout your stay you will be wined and dinned in style with the most excellent home grown organic food prepared with loving care and expertise by your hosts. Loli and Harold have been running successful art courses at Dalvaro for many years so it's great to be invited to join their excellent team. Your accommodation has been beautifully designed, with loving care and using the highest quality materials comprising two private twin and two double bedrooms, (all with en-suite bathrooms), four more private twin bedrooms and one single room (all en-suite), in a separate annex. 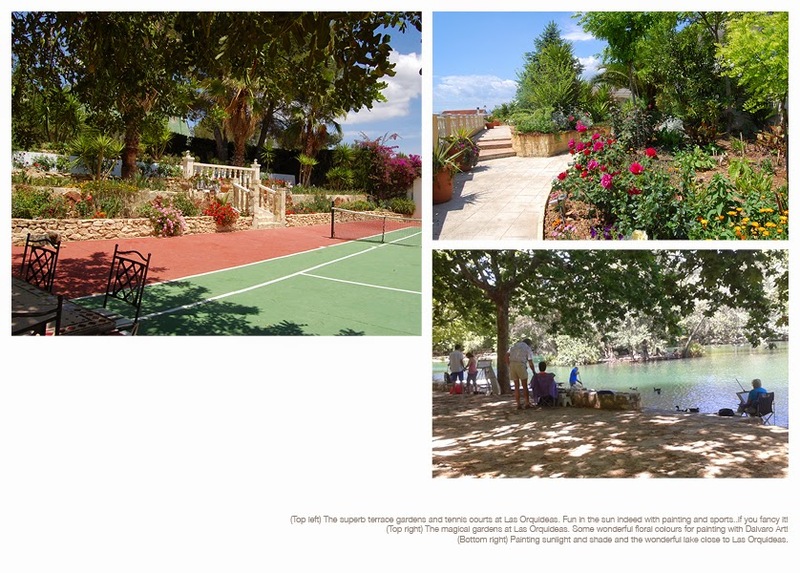 There is even a tennis court too for those who are feeling more energetic and for guests who prefer just to watch, there are many fantastic outdoor and air conditioned indoor dining areas for you to relax and wind away the hours between your daily easy going, fun painting workshops were you will learn lots of different art techniques in style at your own pace. A splendid week of painting with air conditioned studio and outdoor painting experiences using lots of different media. 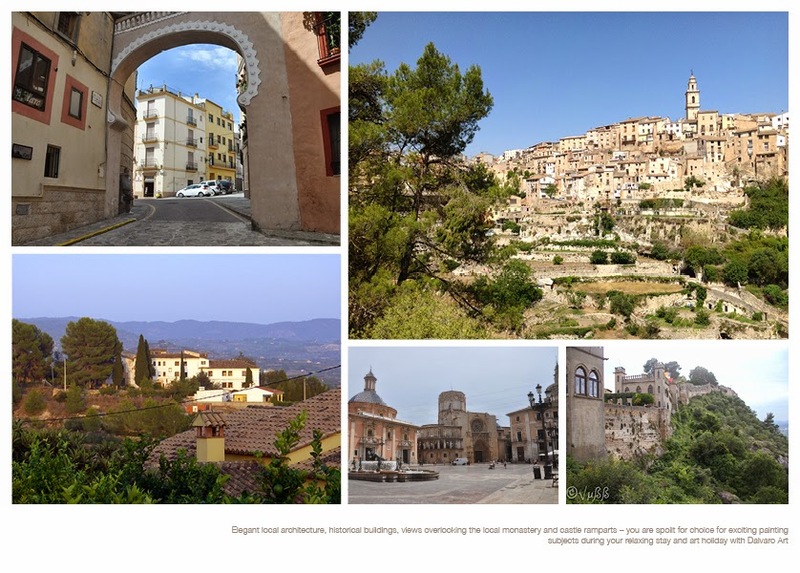 Trips out to the local villages and historic town of Beniganim surrounded by beautiful agricultural land, Orange and Olive groves with some Almonds, Peaches Kakis and Vines. Double or twin room with single occupancy: £1120.00 or €1395.00. Should you wish to bring someone to share then the cost of the room is £1915.00 or €2390.00 for two people.